Dozens of curious citizens attended a public information session — the first since 2006 — on the future of our end of the Windsor-Detroit tunnel on Tuesday night. 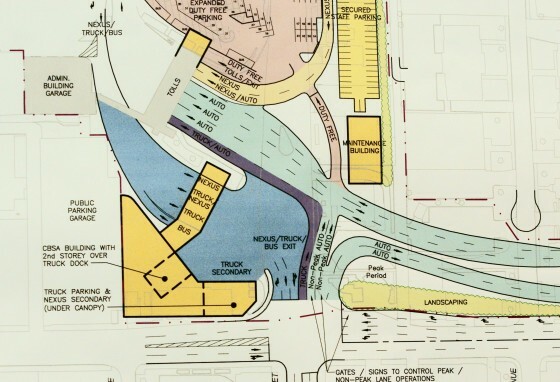 The Downtown Windsor plaza for the Windsor-Detroit tunnel will be getting a major overhaul in the coming years, a plan that has been in the works since the early years following September 11th, 2001. In the early 2000’s, the Governments of Ontario and Canada created a $300 million dollar strategy entitled Let’s Get Windsor-Essex Moving to update and modernize Windsor and Essex County’s border access routes and key pieces of infrastructure. Out of fifteen local projects, the Windsor-Detroit Tunnel Plaza Master Plan, is designed to see a complete rebuild of Windsor’s tunnel plaza to eliminate congestion and backups on nearby streets, provide additional Customs facilities and streamline the crossing process for pre-clearance “Nexus” vehicles. Project manager Michael Chiu described three final ideas for the new plaza, all of which include long access roads for periods of ‘peak’ traffic, special access lanes for truck and bus traffic and extensive landscaping to fit the design within Downtown Windsor’s layout. One of the three design alternatives (pictured) includes a ‘snake’ road, extending as far as Windsor Avenue, while the other two feature slightly more integrated plazas. Due to limited space in the area, final designs plan for the closure of Goyeau Street between Park and Wyandotte. The plaza redesign has been carefully considered to meet traffic projections for the next thirty years. The Ontario Ministry of Transportation having consulted with hundreds of stakeholders in the area, will be drawing together public input for one final public information session this fall. If all goes accordingly, the plaza design will be finalized by the end of this year. Construction of a new plaza is said to commence within two years. You can read more about the Tunnel Plaza Project at the MTO’s website.